You have been working non stop. Creating your newest product to be released to the public. Your excitement level is at a 10, but have you thought about the excitement level of your audience yet? If you want to have a truly successful launch day and beyond, you need to hype your new release before it comes out. Get people ready and waiting your newest release, then be prepared to sell out on launch day! With these 3 simple steps, you can build hype and get the public truly excited and waiting with bated breath. 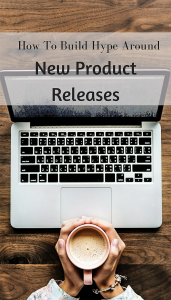 The easiest way to instantly build hype around your new product release, is to blog about it! If you already have a blog, then wonderful and if not, then I highly recommend you look into starting one. Having a good blog and social media strategy can exponentially explode your eCommerce business. By leveraging your blog and social media platform, you can begin to show your new product to your audience and get them excited. The trick is to not show too much. Keep them in suspense, showing just enough of the product to get them palpitating. That way when you release your first full promo ad, they will eat it up! Having blog and social media teasers for new products seems to be the norm nowadays, and for good reason! It builds hype and excitement. People can’t help but be curious and when you give them just a little, it leaves them wanting more. If you aren’t super comfortable with blogging and social media, then you can actually hire a Social Media Specialist to manage your accounts, create blog posts and other content. That way your Social Media Manager can focus on content and building your product hype, while you focus on creating more and more products! You may be asking, “What is Influencer Marketing?” Well, in the simplest of terms, it is using influencers, individuals with large followings online, to promote your products. Influencers will help you hype your new releases to their audience, and are typically much less expensive than traditional forms of advertising. When choosing influencers to work with, be sure to properly examine their social channels and blog to make sure they are a great fit with your brand. Just because they have a big following, doesn’t mean they are right to work with you. Honestly, I could go on and on about how wonderful influencer marketing is for the eCommerce business, but that is a post for another time. For now, just know that influencers can give your new releases some serious hype on social media! It is basic human nature that people want to feel special or like they are among a group of exclusive individuals. When you are contemplating your pre-launch advertising, consider taking just a certain amount of pre-orders. This way, people who really want your product can have a guaranteed spot on release day, you make money, and the hype builds even farther. If you start taking pre-orders, people may wonder… “Will this sell out fast?” “I want one, so I should pre-order just to be safe.” … Pre-orders are a win win when it comes to product launches. Need help setting up for pre-orders for your next product launch? You should think about giving the experts here at ProductCart a call. No matter if you are a brand new business, or you are an established eCommerce shop wanting to expand, ProductCart has features that can help you grow your online business, manage your product launches, and build relationships with your target audience.